On arrival at Entebbe International Airport and after finalizing the immigration formalities, you shall be welcomed by your guide, who will then drive you to your accommodation. Depending on your time of arrival, you may visit Entebbe Botanical gardens for some light birding. After breakfast you will drive to your first birding spot Mabamba swamp. A thick marshy boundary of Lake Victoria that is home to many native and migratory birds’ species. The swamps are famous for the Shoebill Stork. You will take a boat ride to explore the swamps and search for numerous birds including the Shoebill Stork, Squacco, Goliath, Purple and Grey Herons, a variety of Egrets and ducks. In the afternoon you will return to Entebbe and relax. Today you will drive west of Uganda to Kibale National Park; one of the top birding sites in the country. The park boasts of 372 birds’ species of which 60% are native forest birds. The park is also home to the largest diversity of primates in the country. Although it is famous for Chimpanzees, it also home for other 13 primate species which include L’hoest Monkeys, Colobus Monkeys, Mangabeys, Pottos among others. You will also stop along the way for birding at specific points. You will start birding watching in the thick forest with your guide very early in the morning as you follow bird’s calls and other clues. You will be able to spot some of the following species Scaly Francolin, Marsh Tchagra, Black-bellied Seedcracker, Green-backed Twinspot, Bicoloured Mannikin, White-naped Pigeon, Afep Pigeon, Narina's Trogon, Joyful Greenbul, Olive Long-tailed Cuckoo, Black Bee-eater, Blue-headed Coucal, Blue-breasted Kingfisher, Scaly-throated Honeyguide, Roufous Flycatcher Thrush and Black-faced Rufous Warbler. In the afternoon you will go birding watching on a guided walk through the swamps of Bigodi. This is a hub for many birds’ species. The project is community run to support the livelihoods of communities neighboring the park. Today you will track the most famous inhabitants of Kibale National Park, the Chimpanzees. With over 1,450 individuals protected within the park, Kibale forest is home to the largest number of the endangered Chimpanzees in Uganda, as well as the threatened Red Colobus Monkey and the rare L’Hoest’s Monkey. Along the trails in the forest you will also be able to spot some native birds. In the afternoon you will drive to Queen Elizabeth National Park where you will enjoy an evening game drive as you look out for more birds and mammals species. After an early morning breakfast you shall begin your full day birding experience in Queen Elizabeth National Park. 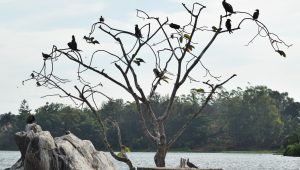 The park boasts of an impressive diversity of vegetation which is a habitat to hundreds of bird’s species. You will bird watch along the Mweya peninsular for the Black-headed Gonolek, Grey-headed Kingfisher, Swamp Flycatcher, African broadbill, Black bee-eater, Grey-capped Warbler, Slender-billed Weaver and Grey-headed Kingfisher. You will also bird watch towards the famous Kasenyi track, winding through grassland dotted with trees and nearby crater lakes. Along the road you may find Martial Eagle,Scaly Francolin, Red-necked Spurfowl, Banded Snake Eagles, several Plovers and Larks, Harlequin Quail and Common Button-quail. 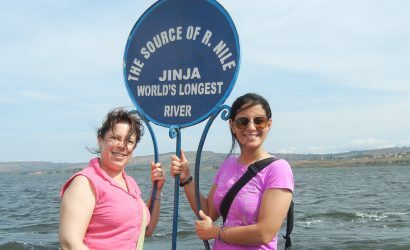 In the afternoon you will take a boat trip down the Kazinga Channel. This area offers stunning views of Pink-backed Pelican, Saddle-billed Stork, Hammerkop, African Spoonbill, Yellow-billed Stork, Water Thick-knee, African Skimmer, Long-tailed Cormorants and migratory Pale arctic shorebirds. You will also be able to spot many mammals species such as Elephants, Crocodiles and Antelopes. Today you will drive to Bwindi Impenetrable National Park. Bwindi is the Bird watchers haven! It holds 348 species of birds among which 90% of the Albertine rift Endemic are here such as the Short-tailed, Rusty-faced woodland and Grauer's Rush Warblers, Bar-tailed Trogon, Wilcock's Honey-guide, Yellow-eyed black Fly-catcher, Kivu Ground Thrush, Dusky Crimson Wing, White-tailed Blue Monarch among others, difficult or impossible to see in any other part of East Africa. An experienced bird watcher can identify up to 100 species in a day. Upon arrival you may choose to go bird watching near your lodge which borders the lush green impenetrable forest. After breakfast you will head into the forest for bird watching. Forest birding in Bwindi ranks the best in Uganda. It is home to 23 highly localized Albertine Rift Endemic species. Special birds to be seen include; Black-faced Rufous Warbler, Banded Prinia, Black-throated Apalis, Mountain Masked Apalis, Red-throated Alethe, Ashy Flycatcher, Dusky-blue Flycatcher, Chapin’s Flycatcher, Chin-spot Batis, Rwenzori Batis, Yellow-bellied Waxbill, Yellow-crowned Canary, Thick-billed Seed-eater, Streaky Seedeater, African Green Broadbill, Shelly’s Crimson wing, Oriole Finch, Mountain Buzzard, Ayre’s Hawk Eagle, Handsome Francolin, Black-billed Turaco, Barred Long-tailed Cuckoo, African Wood Owl, Rwenzori Nightjar, Scarce Swift, Bar-tailed Trogon, Cinnamon-chested Bee-eater, Petit’s Cuckoo Shrike among others. At the end of the day you will relax at your accommodation. 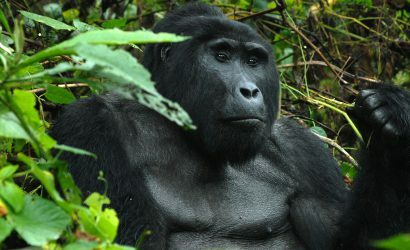 This morning you will get up very early to prepare for the upcoming Gorilla trekking. 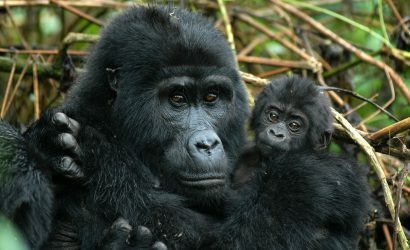 Trekking the Mountain Gorilla is one of the most exciting wildlife experiences on earth. The trek will take between 2 and 6 hours, but is well worth the effort. You will be led by an experienced ranger who will tell you interesting facts about flora and fauna and the lifestyle of the Gorillas. As an alternative to Gorilla trekking, you may take a nature walk in Bwindi impenetrable forest to explore the flora and fauna therein. After breakfast, you will drive to Lake Mburo National Park, the smallest savanna National Park in Uganda. Apart from being home to the rare Eland antelope, this park is also habitat for about 332 species of birds including; the Red Faced Barbet, Long Tailed Cisticola, Papyrus Yellow Warbler, Northern Brubru, Rufus Bellied Heron and Northern brown throated weaver among others. You will take an evening game drive through the park and may have a chance to see beautiful Impalas, Cape Buffalos, Zebras, Oribis, Elands and Topi. You will get up early morning for a guided nature walk. Here you will experience wildlife on a completely new perspective. Enjoy your last bird watching adventure of your safari as you search for some of the native birds species found in this park. You may be able to spot the following species: African Fin Foot, Saddle Billed Stork, Brown Chested Wattled Plover, Carrutter’s Casticola, Great Snipe, Abyssinian Hornbill and White-Winged Warbler. You will return to the hotel for a hearty breakfast and thereafter set off for Entebbe. You will stop at the equator to buy souvenirs or for photo opportunities before heading to the airport to catch your flights back home.